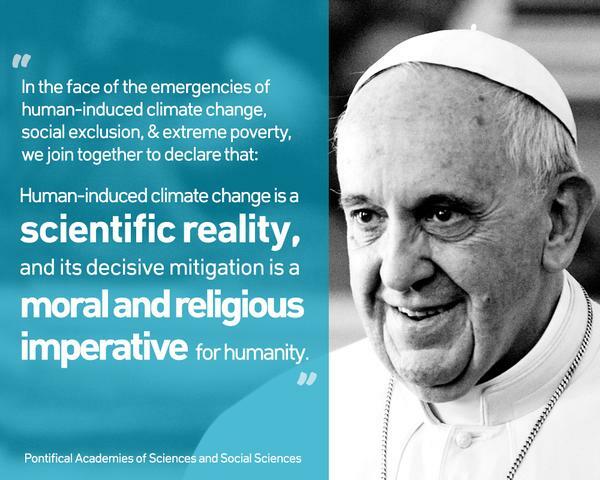 Pope Francis’ Encyclical: a climate game changer? Rarely has a papal announcement received so much interest and controversy even before its release. On June 18, the long-awaited environmental encyclical of Pope Francis – the highest form of papal teaching – will be released to the 5,000 Bishops of the Catholic Church with a message to 1.2 billion Catholics around the world. While the environmental focus of the encyclical was inspired by the 2014 papal visit to Tacloban, a city in the Philippines devastated by the Haiyan hurricane, the interest of the Vatican for environmental matters started much earlier. In 2002 already, John Paul II released his “Declaration on Environmental Ethics”, raising concerns about the degradation of natural resources and the pollution of water, land and air. Pope Benedict in turn, credited for being the first “Green Pope”, said that: “respect for humans and for nature are one and the same”. He installed solar panels and turned the Vatican into the first carbon neutral-state. So the interest of Pope Francis results from a 15-year period of growing interest for the relationship between humanity and nature during which the message of the Vatican was developed and refined. The key points of the encyclical will extend beyond the narrowly defined “environmental sphere” to emphasize harmony with God, with nature and with other human beings. By addressing questions of poverty, inequality and hunger, in a world of plenty where one-third of the food goes to waste while 800 million people suffer from chronic hunger, Pope Francis aims to replace apathy and indifference with global solidarity. In this manner, he can reframe the climate science debate into a moral and ethical imperative that is relevant to all. By bridging science and religion, Pope Francis can provide a universal and non-denominational message that resonates with teachings across faiths. Islam, Judaism, Hinduism and Buddhism, all agree on the moral need for humans to act as stewards and protectors of the Earth and to care for the most vulnerable. The June 18 release will allow Pope Francis several opportunities to address key audiences including President Obama, the US Congress and the UN General Assembly during the adoption of the Sustainable Development Goals that will run until 2030 – all during the month of September, sufficiently ahead of the December Climate Summit in Paris to mobilize the public and world leaders ahead of the conference. Ever since the Rio 1992 Earth Summit, there has been a divide between developed countries, largely responsible for the bulk of carbon pollution, and Global South countries, the frontline victims of climate change impacts. This is why the move by the leading economies to push the “green economy agenda” onto poor nations has been received with great suspicion by developing countries that see this as another attempt at economic imperialism at their expense. Pope Francis, who selected his name after St Francis of Assisi, a man of peace and poverty, is largely perceived as the Pope of the Global South. No one is better positioned to defend the interests of developing nations and ensuring they do not end up on the short-end of any climate agreement. Only Pope Francis has the moral authority to bridge this great divide and allow a historic reconciliation capable of aligning all interests for the benefit of humanity and future generations.